Toyota Motor Corp. plans to regain momentum in the U.S. market by playing to its strength, expanding Prius into a four-model family by introducing a new plug-in, a wagon and a super-fuel efficient model. The plug-in, a competitor to the Chevrolet Volt, perhaps will draw the most public attention. Toyota is banking on Prius' brand equity to defend its status as the world's leading producer of hybrid-powered vehicles. • The Prius v wagon seats five passengers, with 50 percent more interior cargo space than the current Prius. It will be powered by the same powertrain, and is expected to go 42 mpg on the highway and 38 mpg in city driving. It will go on sale this summer. • The Prius Plug-in will have a hybrid powertrain that can travel up to 13 miles on the battery alone. A 110-volt system will recharge the lithium ion battery in 3 hours; a 220-volt system will do so in 90 minutes. In the first half of 2012, Toyota will introduce its plug-in in 14 states on the East and West coasts. The car will go on sale in the rest of the country a year later. • The “c Concept” will have the best fuel economy of any cordless hybrid sold in the U.S., but with a lower price than the current Prius. 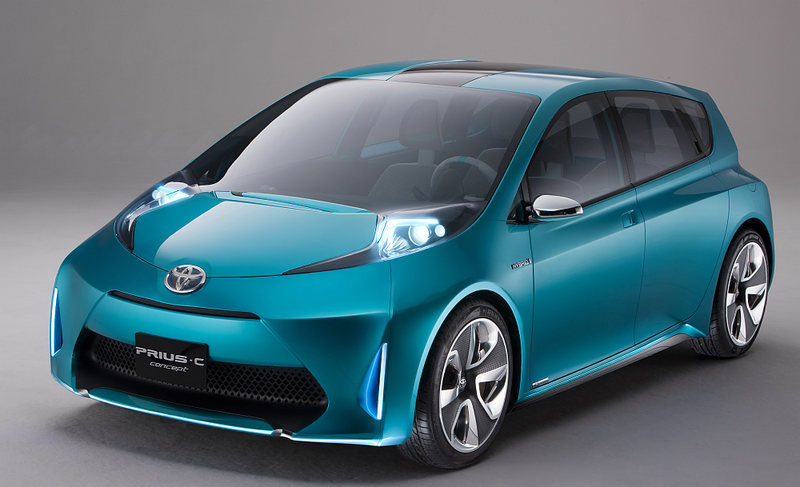 Toyota will introduce a model based on the c Concept in the first half of 2012. While Toyota didn't offer many details, it appears to be aimed at the Honda CR-Z. During a press conference in Detroit today, Carter said Toyota hoped to sell 12,000 to 20,000 plug-ins in the first year of sales. While he did not announce prices, Carter predicted that the Prius Plug-in will be considerably cheaper than the $40,000 Volt. While it can't match the Volt's 40-mile range on batteries alone, the Prius Plug-in's battery pack will be considerably smaller -- hence cheaper. The other Prius hybrids will use Toyota's nickel-metal hydride batteries, which have demonstrated tremendous durability, Carter said. Toyota's joint venture with Panasonic will produce lithium-ion batteries for the plug-in, plus nickel-metal hydride batteries for the other Prius models. Toyota offered few details about the c Concept. Since it will be smaller than the current Prius -- which uses some of the Avensis' components -- the Prius c could borrow parts from the Toyota Yaris. The c Concept also might borrow the Yaris' engine for its hybrid powertrain. While Toyota continues to struggle with stagnant sales in the wake of multiple recalls last year, demand for the Prius continues to be strong. Toyota sold 140,928 Prius units in the United States in 2010; Carter predicts that the four-model Prius family eventually will match demand for the Camry, which generated sales of 327,804 units last year. “When it comes to hybrids, Toyota will remain the leader,” Carter vowed. Good move by Toyota to get ride of competition from Volt, Leaf but Toyota needs to introduce new model which can run 50+miles solely on battery power.